I often partake in what I think many refer to as the “classic American breakfast.” It consists of two eggs, a hunk of meat, some potatoes, and a grain of some sort. It usually runs about 1200–1500 kcal and can easily satisfy two meals. The problem many have is that it doesn’t contain much innate sweetness, so if you need a sugar fix, you have to get a side of pancakes or wrestle with the cheap, plastic, single-serving packs of Smucker’s jelly. Neither of these are good options; the former because it’s just too much and the latter because it’s just not enough. Revolution Brewing has figured things out. They’ve addressed this problem to near perfection. The grain of some sort is a fluffy biscuit and if you throw on some of the syrupy, fruity concoction that they serve in a little chrome sauce cup your sweetness cravings are satisified. Not too much, not too little, just right baby. It’s all there in the picture above. 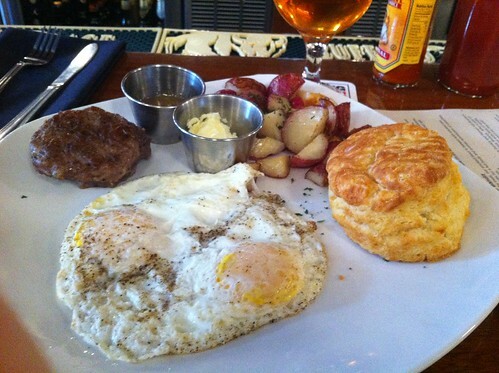 That’s two eggs over easy, a sausage patty, fried potatoes, and the biscuit thing. Not bad for $10. Great stuff, but only one of the many reasons to visit this Logan Square gem. There’s beer. Lot’s of it. I grabbed a beer since it was after noon and it was a holiday (NYE). I ordered a golden lager or IPA, unfortunately I can’t remember which and I don’t have the ability to tell by looking at it. I’m colorblind when it comes to browns and oranges. Gail and I did try a little something special. We got a tasting of the B.A. Baracus, their Russian Imperial Stout aged in bourbon barrels for a year. It’s intense. I’m not a liquor drinker at all and I don’t particularly like bourbon or whiskey, but I found this sort of drinkable. I need to try it again, knowing that it could lead to a bad place. I dabbled in coffee back in the 90s by starting with cappuccinos and lattes, and now I’m a black coffee addict. You can see the parallels, not good. This place is conveniently located on Milwaukee Ave just south of Fullerton. The 56 Bus goes right by it and it’s near the California Blue Line stop. You know what, if you have three hours and you’re stuck at O’hare, this would be an awesome quick trip. It’s a unique place in a cool Chicago neighborhood. In fact, I’m going to start tagging things with ORD layover so I can accumulate ideas for people stuck at O’hare for a while. It’s bright and modern with a cool logo. I find myself raising my fist in defiance for no reason at all. I will be back. Posted in food, tagged brewpub, Logan Square, ORD layover on 2012/04/14 by John.